So, you’ve decided to train for your first full marathon. Good for you! 26.2 miles is a long way and now you’re here to figure out how to get the training started in the best way. This will be a journey of many small achievements and success, and perhaps even some setbacks. Please don’t forget to celebrate each step forward. It’s the entire process, not just the end result, which you should take pride in! Your training will require hundreds of miles and many hours of cross training. Race day will be the culmination of all of your efforts up to that time. Keep a journal of your progress. That’s one of the absolute best pieces of advice that I’ll write here. You don’t need to get a fancy, marathon specific, journal to be effective. Log the date, distance, time of day, overall time, pace if you have that info available to you, weather conditions, as well as how you felt at the beginning, during and after your training session, and perhaps general thoughts and impressions. Why are you taking on this challenge? It’s important for you to think about the answer to my question carefully and write down your thoughts/answer(s). Why, because it will take a long time and lots of effort to accomplish it, and you’ll likely question why you’re training for it a few times during the process. You’ll likely need that/those answers, perhaps several times during the process. There is no right or wrong answer; it depends on what is motivating you to do this. My next question for you is: have you worked your way up to this distance by training for and completing shorter distance races? If not, then this will be quite a bit more difficult for you. A bucket list item, a one and done plan, can be very hard on your body and your mind. That’s not to say that people haven’t done that before, but the failure/injury rate is very high among those who take that approach. I suggest that the best sequence of races is: 5Ks, 8Ks, 10Ks, 15Ks, 21Ks (a half marathon). You don’t need to complete each one in that exact progression, but it is helpful to your body and your mind, especially if you are starting from scratch (slow steady progress is the key). If, on the other hand, you’ve completed a few of these race distances, especially including a half marathon, then you have not only gained valuable experiences in each of your prior races but your body has likely been able to develop properly to withstand the stress of endurance training/racing. I believe that you should plan on about 18-20 weeks of base building training for your first full marathon (assuming that you have about 6 months of running experience and are currently running about 20 miles per week). That means that you should build your weekly mileage slowly over about 17 weeks. Once you’ve got a good base of miles behind you it may be time to start adding some speed work to your training. During that phase you should begin slowly adding tempo runs for a few weeks and then add some intervals and hills (not at the same time). Did you know? Most estimates are that between 50 and 70% of all runners will experience an injury each year that will cause them to take time off from running!!! Significant causes of injuries include trying too do to much too soon, not listening to their bodies properly, not adjusting training/racing intensity in relation to current weather conditions, etc. In order to avoid become an injury statistic please consider your training approach. You will find beginner training plans which start the Sharpening workouts quickly, and if you choose one of them the best advice I can give you is listen to your body. While you can’t be a wimp and be an endurance athlete, you do need to learn the difference between a desire to have an easier workout and an indication that something needs attention. The vast majority of running injuries are overuse injuries which do not happen quickly. a) I miss a day because of illness or injury? b) I need a rest day and my schedule calls for a hard day? c) I missed a whole week of training? d) My …….. hurts, should I run on it? The answer to all of these questions is to learn to listen to your body and respond to its needs! Skipping a day or a week will not cause you to fall into immediate decline. Do not feel guilty; your training plan is an outline for you to follow. Adjust it as needed. Do not add the missed workouts or mileage into your future schedule. If your body tells you that it needs a rest, listen to it. If it seems to be telling you that often, then your training plan may too demanding for your current physical or emotional condition (other life stress can cause problem during your training). If something is painful while running on it, that’s your body’s way of tell you that it’s being abused. Find out what’s causing it and make a change. A major goal is to remain healthy, injury free and enjoy your running, not to rack up as many miles and consecutive days as you can. If you have missed workouts, it may be necessary to drop back to an easier schedule for several days or weeks and then gradually return to the previous one. Long Runs during your base building phase should be progressively longer long runs, likely on a weekend (preferably on the same day of the week as your goal race). These are done at a very comfortable pace. That pace is one during which you can hold a conversation without having to catch your breath between sentences and paragraphs. Most people use to fast a pace during their long runs. Think endurance here, not speed. Weekly Runs during your base building phase should be done 3-5 times a week at a comfortable pace for you. These distances should be fairly consistent each week and should be short runs of 3-6 miles, and getting longer throughout the base building period. Once you’ve built a base of at least 40 miles a week during the base building you may be ready to slowly add Intervals, Tempo Runs and Hill Repeats to your training. Long Runs should continue to progress in length during this period to about 18-22 miles in length (will likely depend on the specific training plan you’re following). Weekly Runs listed below are optional for a first marathon as adding them too soon will greatly increase the chance of being injured. If you have been running consistently for a year or more you are likely ready to introduce them slowly into your training plan. Whenever you decide to introduce them you should be very careful to progress slowly as they will stress your body significantly more than your base building training runs. Intervals are repetitions of a short distance which you run at a fast pace for you, with recovery jogs in-between. For example, you might run 4 X 800 intervals at a hard pace (800 meters = twice around a standard track and is about a half mile), with a quarter mile (once around a standard track) of slow jogging and/or walking between repeats, then you do it over again for a total of 4 times. You can also do the intervals on a road if a track isn’t available. You should not be able to speak in sentences without taking a breath between words during this type of workout. These workouts usually start with a 10-15 minute warm up jog and are followed by a 10-15 minute cool down jog. Tempo Runs are longer training runs than intervals and vary in length depending on where you are in your training. Tempo runs are run at a pace which is often called comfortably hard (a comfortable and hard pace may not make sense to you right now perhaps, but it should be at a pace which will allow you to speak a sentence before having to take a breadth, but not a paragraph. It is a pace which you can sustain for the entire tempo workout. These workouts usually start with a warm up mile or two and end with a cool down mile or two. Hill Repeats are intervals done on available hills. They should be done occasionally on alternate weeks from the Intervals. Start slowly and work up to longer hills and faster speeds. The first few Hill Repeats should be run on moderate hills and may only last for 10-15 seconds. They are run at a moderate pace and are followed by a jog back down to recover. Hill Repeats are excellent conditioning runs but you need to increase distance and speed very gradually. The biggest challenges to marathon training are: 1) staying healthy, 2) continuing to make progress in conditioning, endurance and speed, and 3) staying motivated. The final phase of training is tapering or resting prior to the race. Research has shown that most marathoners state their race over-trained. The Taper Period is important to maximize performance. The amount of rest you will need is related to the amount of weekly mileage you’ve reached. Beginners and runners with low mileage will take longer to recover. The key to tapering is reducing the distance of the long run with the last long run occurring about three weeks prior to the race. The mid-week mileage is reduced about two weeks prior to the race. Mileage is initially reduced to about 75% of the recent high week’s mileage and then reduced again the following week to about 50%. No long run should be done the weekend prior to the race. If you’d been doing some speed-work in the preceding weeks, then a small amount is beneficial during the week before the race. Please note that this drastic reduction in training mileage, and perhaps intensity, may have side effects. Many get edgy during this phase. Please resist the urge to go for another long run or hard sharpening workout. Running a few easy runs of 10-30 minutes can take the edge off. When training for a fall marathon you’ll start training during the summer with the heat and humidity (the humidity is highest in the mornings when the heat is the lowest). Please pay special attention to hydration (not just water), prolonged sun exposure (use sunscreen) and protect your eyes with sunglasses. These are all serious issues to deal with and extreme caution is important. In extreme heat and humidity adjust your training paces and perhaps your distances. DO NOT try to run the same distances and at the same paces during these periods. And don’t do it in your races either. You should be slowing down with each 5 degree increase of temperature above 65 degrees. When training for a spring marathon you’ll start in the winter and may have to deal with extremely cold weather and ice. Many people training for a spring marathon are taking some of the training inside to a treadmill occasionally. I personally avoid this as much as possible, but I admit that it’s a much better alternative than skipping a number of runs due to ice and extreme cold. BTW – our race offers free training runs, starting no later than in December for our marathon which is on the last Sunday in April (new date starting in 2014). We will post information about those free training runs on our Facebook page. How often should you train each week? That’s a difficult one for me to answer for you as it requires knowledge of your: age, health, past athletic activities, current physical conditioning, motivation, available time, etc. In general, 3-5 times per week is the number of days which most people train on the roads/trails. On most of the other days you should be cross training, paying special attention to your core (front, sides and lower back) and upper body (especially your mid and upper back, neck and shoulders). The other equally important parts of your training plan are: rest (including sufficient amounts of sleep), nutrition and hydration. Please DO NOT think of your training plan as only the time actually spent running, as so many people do! Many people think that training is all about getting their legs, heart and lungs stronger by building endurance and perhaps speed. Well, that’s part of it, but there are many other adaptations which must take place inside your body and which you can not see happening. Since this isn’t an anatomy lesson, I’m not going to discuss them here, but strong legs and heart muscles and healthy lungs are not enough to get you to the finish line (or likely anywhere near it for many people). The important advice here is that you should increase training effort (speed), duration and distance in small steps (about 10% per week) so that all of the necessary adaptations can occur before you stress your body even more. A little stress each week is exactly what you are aiming for, as it is the stress which is helping you improve your conditioning and speed. Too little stress and there’s little to no improvement. Too much stress and you’re likely heading to burnout and/or injury! Some great online resources with marathon training plans are http://halhigdon.com and http://runnersworld.com. There are many others. The final part of any smart marathon training plan is rest. Don’t underestimate the importance of this element. Most runners are happier and less injury-prone with a few rest days built in to each week. Rest days mean no running. They let your muscles recover from taxing workouts and help prevent mental burnout. The greatest enemy of any aspiring marathoners is injury, and the best protection against injury is rest. If you are itching to do something active on your rest days, doing some cross-training is a great option. Cross-training can include walking, hiking, cycling, swimming, yoga, lifting weights, or any other active pursuit that isn’t as high-impact as running. In the last couple of weeks leading up to your marathon, scale back significantly on overall mileage and difficulty of your runs to let your body rest up for race day. This is called tapering, and it’s absolutely crucial to preparing your body to be in tip-top shape to cover the distance. Nearly all marathons include water and aid stations along the way. The best advice for race day—especially if you don’t plan to carry any of your own water—is to stop at every one of the tables for a few seconds and gulp down some water and, when available, sport drinks that replace sodium and electrolytes. If you do plan to carry some of your own water on race day, buy a hydration pack or belt long in advance and get accustomed to running with it. Never try something new on race day. Do long runs on a short loop course, so you can stash water in one spot along the way. Plot your long run route to pass water fountains (but during colder months, make sure that they’re turned on). Stash water bottles along your route the night or morning before your run. You’ve probably heard about the phenomenon many marathoners experience right around the 20-mile mark, commonly called “hitting the wall” or “bonking.” Your body can only store so much glycogen – its primary source of energy during the marathon. As this level gets depleted over the course of your marathon, your muscles will begin to tire and feel heavy. While no amount of fuel consumption during the race can entirely replace your depleted glycogen, consuming small amounts of carbohydrates can help prevent you from hitting the dreaded wall. Energy gels or chews are the easiest to carry and often easiest to digest – but a few pieces of fruit or an energy bar can also do the trick. For any run over 2 hours, aim to take in about 60 grams of carbohydrates per hour. As with everything, make sure to test out various types of fuel on your training runs to see what your stomach tolerates best, so you can fuel confidently on race day. I hope that you find the info above helpful in planning for your first full marathon. I would be happy to be a sounding board for general questions regarding training. Please remember, there are also PTs available on this blog which you should utilize whenever you have a question about physical issue, which you may experience from time to time during your training. I look forward to your questions and comments on training. I will do my best to give you helpful advice; however I likely will not be able to give you specific training advice since I don’t have enough information about you. I am not taking on additional students so this isn’t meant to be a recruiting pitch in any way. 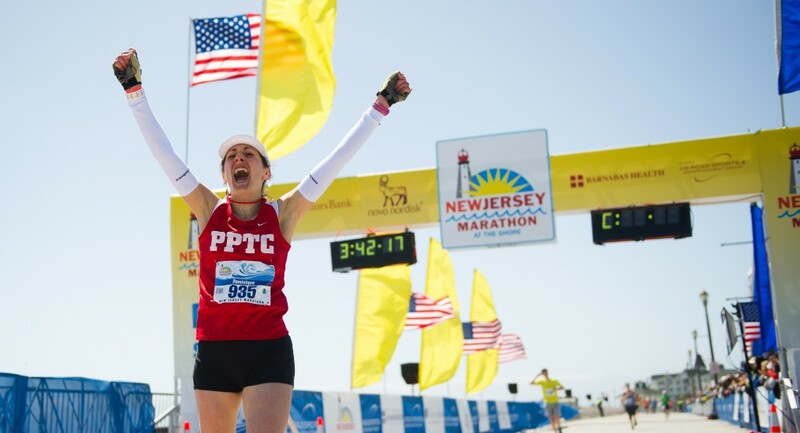 In fact, you don’t need to be training for The New Jersey Marathon in order to ask questions on this blog.